Grassfast lies lightly over the seeded area and traps heat and moisture to speed and increase grass seed germination. While it retains warmth and moisture, it vents excess heat, which also increases and speeds seed germination. Grassfast stops erosion from heavy rains as well as protecting the new seedlings from insect pests, birds, and animal damage. How do you use Grass-Fast®? Prepare the soil and plant the grass according to the recommended procedures. Instead of using straw to cover the newly planted seed, cover the entire area with Grass-Fast. Water the area thoroughly. Keep soil under fabric moist until seeds have thoroughly germinated. Leave in place until grass is beyond the “delicate” stage or until the daytime temperatures begin to approach 85-degrees. It is desirable to leave it in place as long as the weather is cool. Also, the benefits derived from using Grass-Fast versus straw more than pay for the extra cost of the cover. For detailed instructions see the file Overseeding Lawns and the file for Starting Lawns From Scratch. Can I use Grass-Fast for spot seeding and repairing damaged areas? What are the benefits of Grass-Fast over straw? - You will usually get 90-95% germination of your seed with Grass-Fast, vs. 50-70% using straw. - You will get almost complete uniformity in your coverage, vs. very spotty results with straw. - You will find your seeds germinate in about 1/3 the time. This is because Grass-Fast warms the soil 10-15 degrees while straw actually shades and cools the ground. This means that you have to spend 3 times the length of time making certain that the soil never dries out. Drying out is death to germinating seeds. - You generally only have to thoroughly water initially for the moisture to be retained by the fabric. One watering will usually see the seeds through to complete germination unless it is very hot or windy. - The fabric keeps birds from devouring the seeds. - The complete coverage of your grass with Grass-Fast will dramatically reduce your weed problems. - Straw has to be removed at just the right time, or it can smother the seedlings that are trying to develop. Grass-Fast can be left on and only has to be removed when the temperatures regularly exceed 85 degrees. I followed the instructions, but now I see the young grass sprouts coming through the Grass-Fast. Shouldn’t they be underneath, and won’t they be pulled up when I remove the material? This sometimes happens with very fine grass varieties, or in semi-shaded areas where the grass blades grow very thin. If you leave the material on too long, then yes, many sprouts will be pulled up when the material is removed. The problem is easily solved, however, by lifting the material early on, before the blades thicken and become lodged in the fibers. Lifting is sometimes easier if you get a stick and drive a large finishing nail (headless) into the end of the stick. Bend the nail and use it to penetrate the fabric and lift the fabric straight up, freeing the blades of grass. After lifting, the material will settle down on top of the grass and be held up by it. You may have to do this a couple of times before the grass becomes mature enough not to penetrate further. Does Grass-Fast cost more than straw and is it worth the cost? Before answering, consider the cost and labor involved in establishing a lawn, and think what you are trying to accomplish in having a lawn. It is a major project which, if you do it right, will increase the value of your home significantly and will give years of pleasure. If you do it right, your lawn will be the envy of all those who see it. Yes, Grass-Fast initially costs two or three times what straw costs, but few things pay back as thoroughly as does Grass-Fast. As a percentage of the overall cost of the project, the use of Grass-Fast over straw only adds a few percentage points. If you can use it several times, it ends up being much less expensive than straw that generally can only be used once. Also, the benefits derived from using it over straw more than pay for the extra cost. How do you hold Grass-Fast in place? 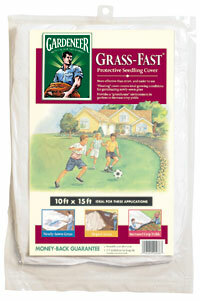 Anchor Grass-Fast in place with Gardeneer® Garden Staples™ which are inexpensive and very easy to use. It is desirable to double the thickness of the fabric by folding over where the staple is inserted. Put a staple in every 3 to 5 feet. How often do you water the grass seed? Observe the soil under the fabric and water the area whenever the soil seems to be drying out. THIS IS MOST IMPORTANT! The fabric does a wonderful job of retaining moisture by deflecting the wind and condensing the vapor. Except in windy areas and in hot weather, the initial watering will usually see the seeds through germination.